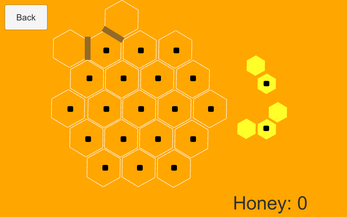 Visit the official Honeycomb page at https://cvprogramming.tk/honeycomb.html. Welcome to Honeycomb! 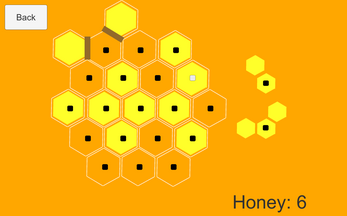 The goal of the game is to get as much honey (points) as you can by completing rows of hexagons. (As show below). Rows can be made in any of the three possible directions, and you will get points if the rows go completely from one end to the other. To make your move, simply click the black dot on the block you would like to use, then click the dot on the grid of where you would like to place it. Remember, the brown rectangles are walls, and you can't complete rows, or place blocks over them. If you would like to report any bugs, please send them to me at vieirast@icloud.com. Suggestions are welcome too!